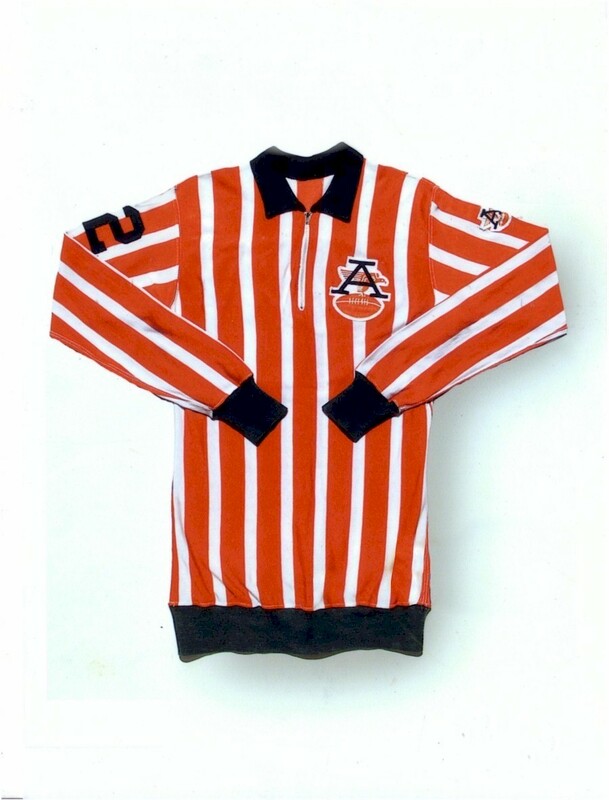 Just is it did in many other innovative ways, the American Football League had a unique take on the uniforms of referees, umpires, linesmen, field judges and back judges. 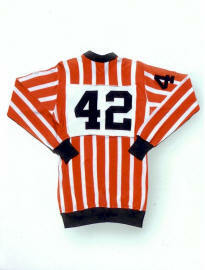 With their red-orange stripes, black collars and cuffs, and AFL logos on their shirt fronts, sleeves and caps, they were not only more colorful, but easier to see than those of the other league. This page is to recognize an important but seldom credited part of the game: the American Football League's on-field officials. 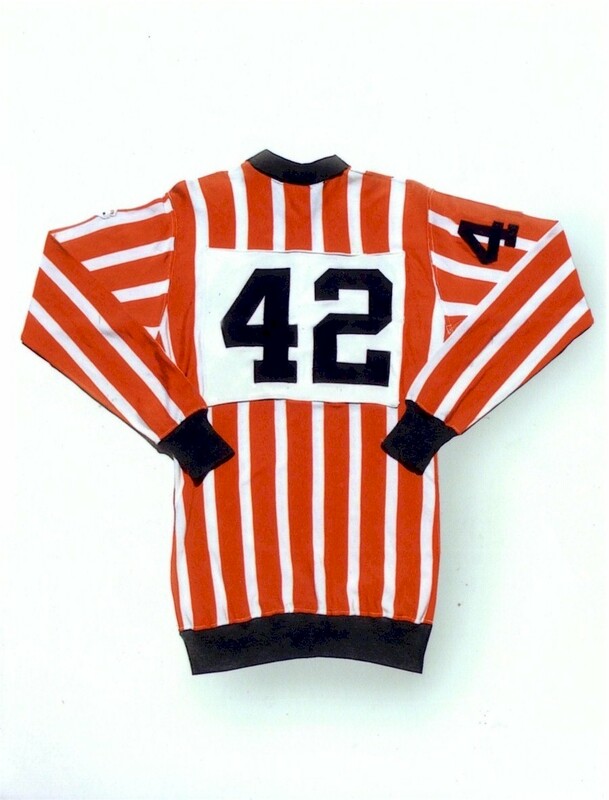 In his book COLORS, Jim Finks Jr., son of the Hall-of-Famer, shows the original uniform of AFL official Jack Reader, who was a Back Judge in both the first and third World Championship games, and who was in an iconic Sports Illustrated photo, signaling touchdown after Matt Snell's 4-yard plunge against the Colts. 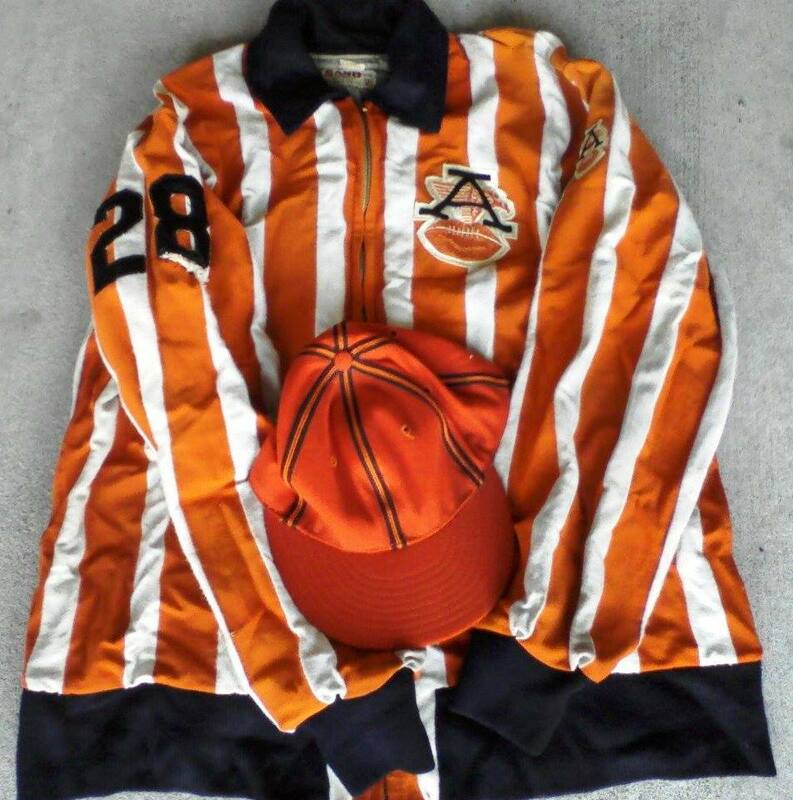 Finks sent us the images below, of Reader's original uniform. I hope to add below the name of every man who officiated in the American Football League, the genesis of modern Professional Football. I am indebted to Albert Klumpp for the major portion of this list, and to Dave Owczarzak, a.k.a. 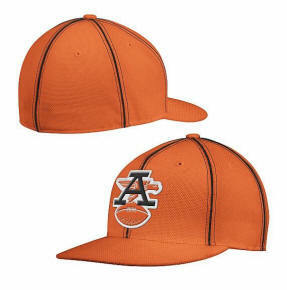 AFL collector bflodave. If anyone has 1960 and 1961 records of AFL officials, please help me complete the list. Thanks, too, to Jim Tunney, former NFL supervisor of officials, who provided contact information. 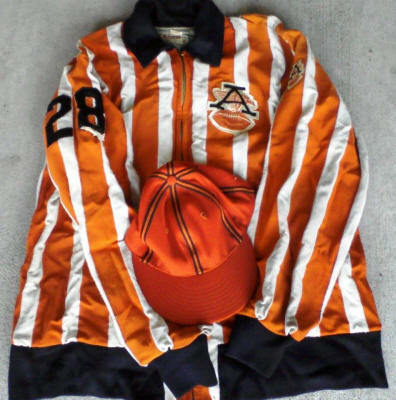 Al Huetter's winter uniform shirt and cap. SOURCES: 1960 AFL Game Program - Oilers at Texans 9/2/60; 1961 AFL Game Program - Broncos at Titans 9/24/61; The Sporting News annual Official AFL Guides, 1962-1969. 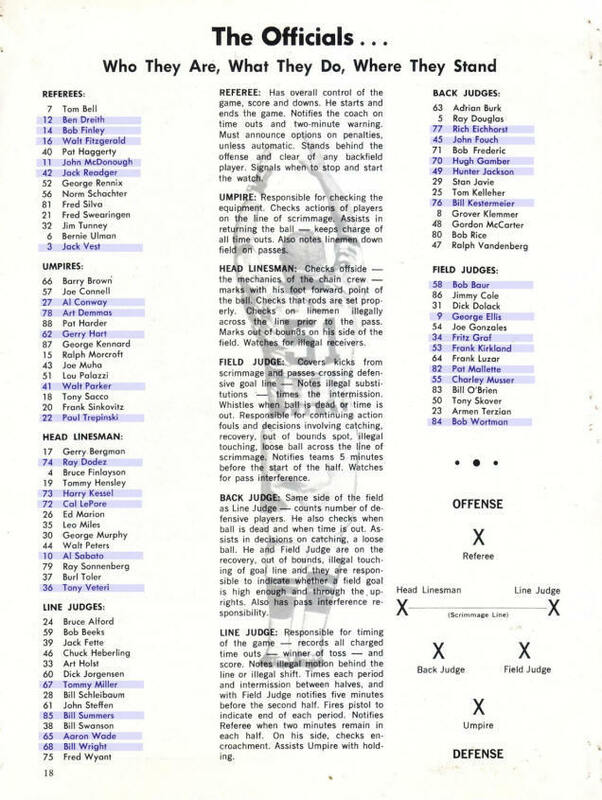 NOTES: Position listings provided only in 1960 Program and 1966-1969 Guides; uniform numbers provided only on 1960 and 1961 Programs and 1966-1969 Guides; colleges not provided in 1960 Program. 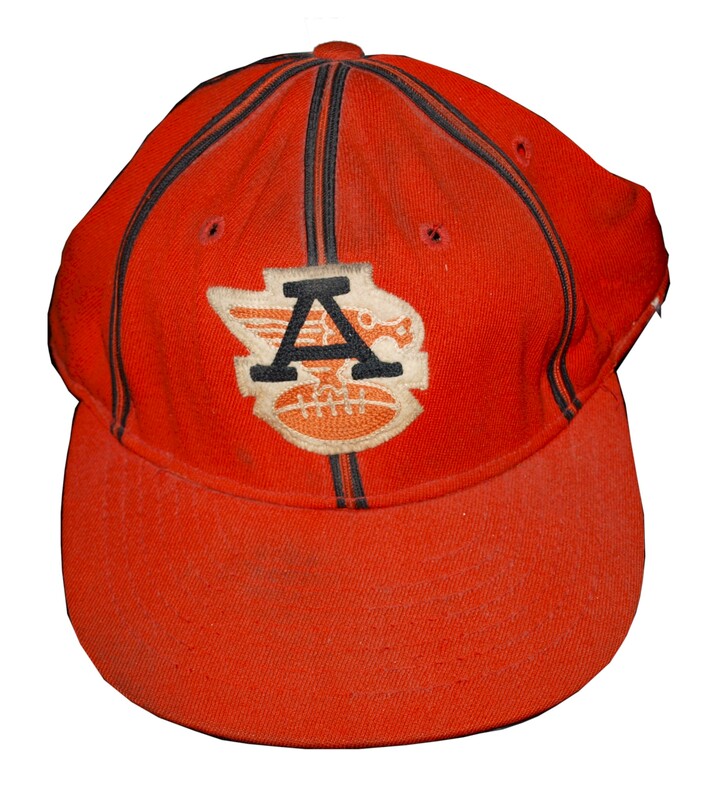 ACKNOWLEDGEMENTS: 1960 list provided by AFL fan Jim Fulton; 1961 list provided by memorabilia dealer Jack Wallin ('hull9howe999' on e-bay). 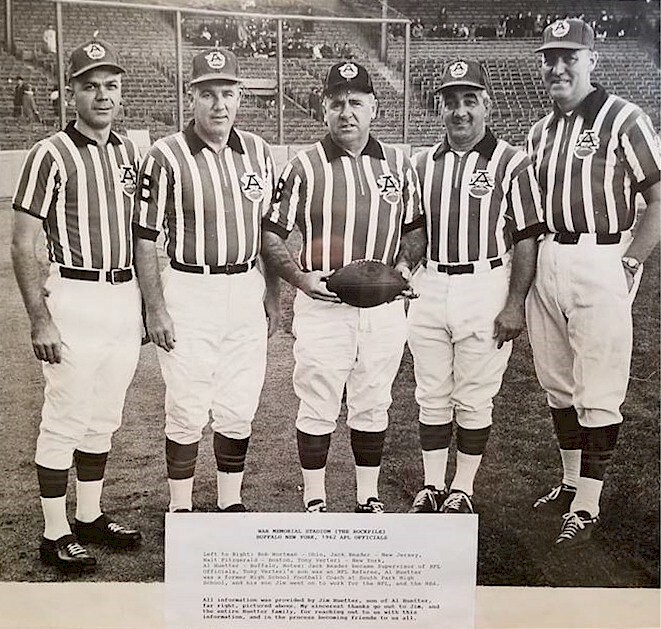 The nine men highlighted in the above list officiated in the American Football League for the entire ten years of its existence, 1960 through 1969. They were: Ben Dreith (FJ, R); Bob Finley (U, R); Hugh Gamber (BJ, FJ); Elvin Hutchison (HL); John McDonough (R); Walt Parker (U); Jack Reader (BJ, R); Al Sabato (HL) and George Young (U). Imagine the stories these men could tell about the AFL! 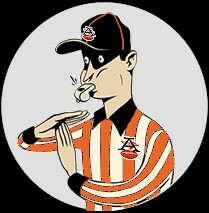 I have created a page about AFL officials, on Wikipedia. Click here to see it. See individual official's pages there, to read more tidbits like those below. Jim Tunney received an offer from the AFL to be a referee in 1960, but chose to go to the NFL as a field judge. Years before Pete Gogolak, Fritz Graf was the first "jumper" from the AFL to the NFL. He was in the AFL in 1960, officiated its first Championship, then went to the NFL in 1961. Jack Reader, who died in 2008, was a ten-year AFL official who worked the league's first game (Broncos-Patriots) on September 9, 1960 and the first Super Bowl. Bob Wortman was the first man to officiate both a Super Bowl and an NCAA basketball championship. Frank Rustich was an AFL line judge and also a boxing referee who officiated at the 1973 Ken Norton-Muhammad Ali Heavyweight Boxing Championship. 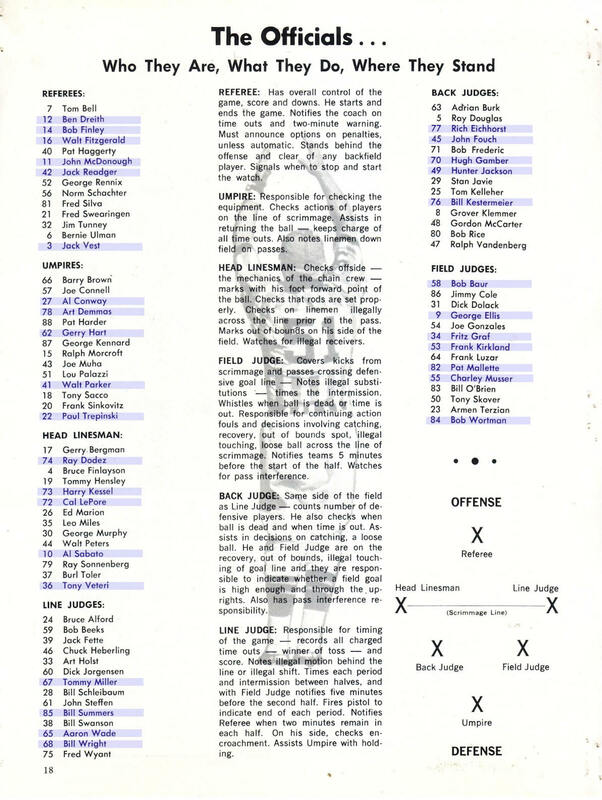 The article below is from a 1970 Buffalo Bills game program. It lists all Professional Football officials who worked games in 1970. 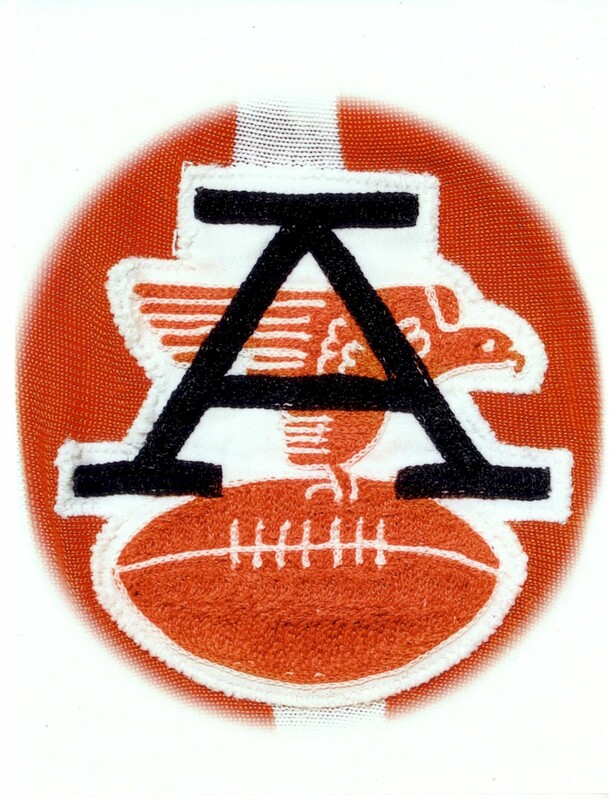 Former American Football League officials' names are highlighted. Uniform numbers and positions listed in this table may have changed from those in effect while in the AFL. The photo is of Frank Rustich, an AFL line judge in an AFL uniform, number 51. 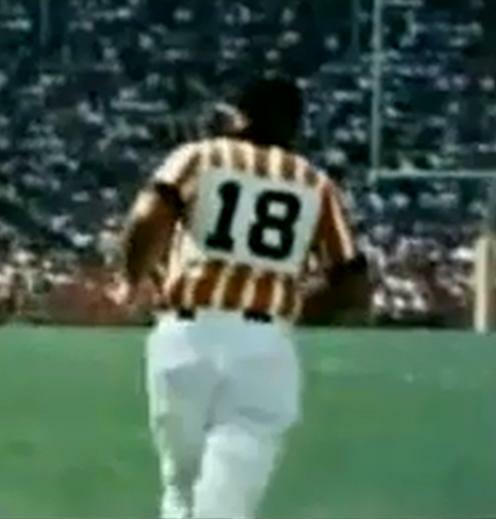 Some of the officials wore different numbers after the merger. The above list shows only the numbers they wore in the American Football League. There were 34 on-field officials in the AFL in 1969. 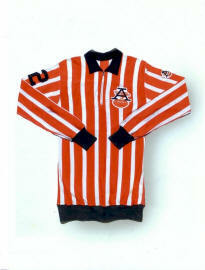 Interestingly, 32 of them, from an "inferior league", were good enough to continue to officiate after the merger. One of them was Cal Lepore, now known as "the father of instant replay". He also promulgated the use of replay to review the accuracy of on-field calls, for the evaluation of officials' performance. Another important link from the American Football League to today's Professional Football. The photo below is was taken at Buffalo's War Memorial Stadium in 1962. 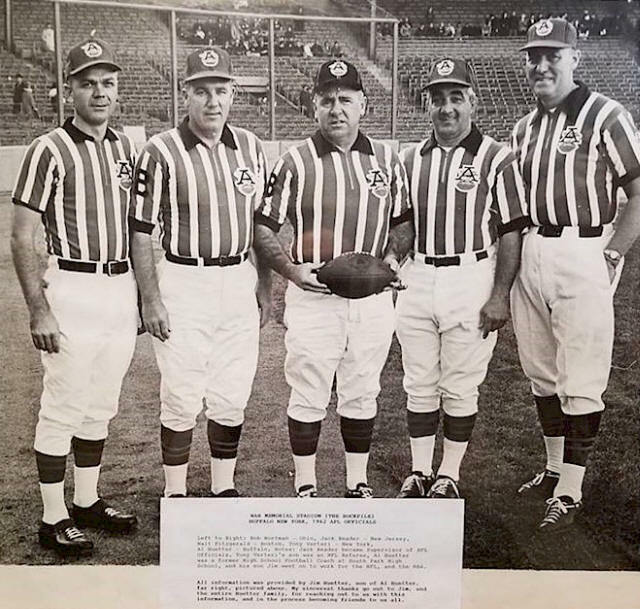 AFL officials: Bob Wortman, Jack Reader, Walter Fitzgerald, Tony Veteri, and Al Huetter. Photo from Huetter's son Jim, courtesy of Marinaro's Larkin Tavern, 131 Van Rensselaer Street, Buffalo. image courtesy of Scott Davis. More RED than ORANGE, wasn't it?